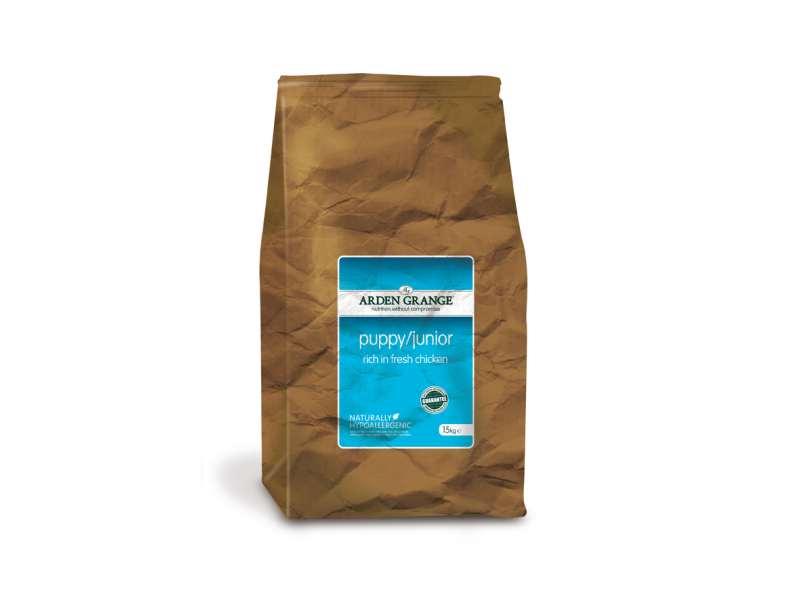 A unique, tailored diet for puppies and juniors, containing a balance of controlled fats and proteins for healthy growth and development. Puppy Rich in Fresh Chicken from Arden Grange is both palatable and highly digestible, with calorie-dense chicken for building muscle and strengthening natural immunity. The small kibble contains added antioxidants and nucleotides for providing additional support to the immune system, whilst helping to protect internal systems. Fresh chicken (18%), chicken meat meal (18%), rice, maize, beet pulp, chicken oil, whole dried egg, yeast, fish meal, chicken digest, linseed, fish oil, prebiotic FOS, prebiotic MOS, cranberries, yucca extract, glucosamine, MSM, chondroitin, nucleotides. Crude Protein 29%, Fat Content 18%, Crude Ash 7%, Crude Fibres 2.5%, Calcium 1.3%, Phosphorous 0.85%, Omega-3 1.11%, Omega-6 2.66%. Vitamins: Vitamin A 21,000 IU, Vitamin D3 1,516 IU, Vitamin E 147 IU. Trace Elements: Zinc chelate of amino acid hydrate 292mg, Zinc sulphate monohydrate 243mg, Ferrous sulphate monohydrate 146mg, Manganese sulphate monohydrate 101mg, Cupric sulphate pentahydrate 35mg, Copper chelate of amino acid hydrate 29mg, Ferrous chelate of amino acid hydrate 21mg, Calcium iodate anhydrous 2.1mg, Sodium selenite 0.6mg. Antioxidants (rosemary and tocopherol-rich extracts). There are currently no questions for Arden Grange Rich in Fresh Chicken Puppy/Junior Food - be the first to ask one!